If you get an error like this during uninstallation of a 2003 exchange: “0x80072030 (8240): There is no such object on the server” It is because in the process of uninstalling some organization information is not found; in my case what was missing was the container of the recipient update services (I had just deleted it before by mistake instead of deleting the single object). 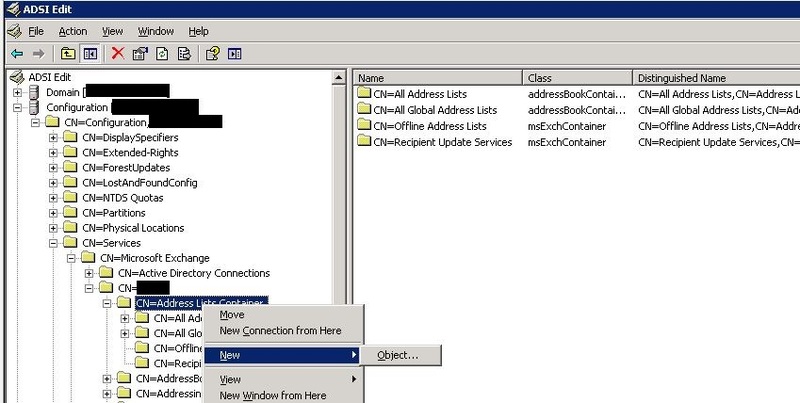 Verify that there is “CN=Recipient Update Services”, if it does not exist create it by clicking (within adsiedit -> configuration ->Services -> Microsoft exchange -> Organization Name -> Address Lists Containers) on new->Object and set ad class “msExchContainer”. If this is not the problem likely some other information is missing in the schema, but you have to understand what. At this point re-launch the uninstall process and it should continue!